The spinal column is made up of small pieces of bone called vertebrae. 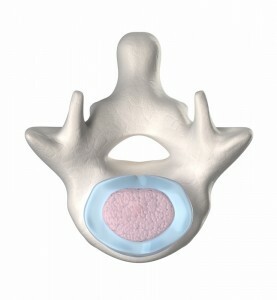 Each vertebra is separated from the next by soft and rubbery tissues that are known as intervertebral discs. The intervertebral discs are important in absorbing shock and force from standing upright, walking, and other everyday movements. They also allow the vertebrae to glide smoothly along each other, allowing the spine to flex, bend, and twist. The intervertebral disc has two main parts: a soft and jelly-like substance in the middle known as the nucleus pulposus, and a thick and tough outer layer of cartilage surrounding it, called the annulus fibrosus. The spine houses many important structures, such as the spinal cord, nerve roots, arteries, and veins. The spine also serves as an attachment for the muscles and ligaments of the back. Over time, the annulus fibrosus weakens. When this happens, the jelly-like nucleus pulposus can bulge through the weak points. This condition is known as disc bulging. If part of the outer disc tears and a piece of disc pushes through, this is called a disc herniation. There has been no single cause identified for disc herniation, and this condition is normally attributed to the changes with aging. However, it has been noted that people with jobs that require a lot of strain on the back tend to be more prone to disc herniation than the general population. Smoking and obesity are also identified risk factors. The herniation of the disc causes compression and irritation of the spinal nerve and nerve roots, causing the symptoms of pain, reduced sensation, and motor weakness. 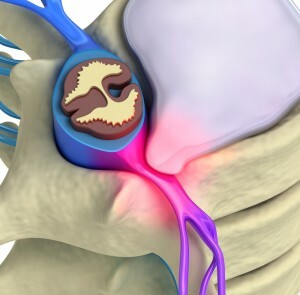 The presentation of the symptoms of disc herniation will vary, depending on the location and the extent of the herniation. The best treatment option for disc herniation will depend on the particular circumstances of the patient. The range of therapies needed to address disc herniation varies as widely as the possible presentations and severity of the case. That is why it is important to discuss your injury case with a Board Certified Phoenix workers compensation pain doctor. In some cases, mild disc herniation can resolve spontaneously and not require a Federal or Arizona workers compensation doctor’s intervention. Research has shown that conservative and nonsurgical treatment can provide relief of symptoms in up to 90% of patients suffering from bulging disc pain. These options include the prescription of pain medications, such as non-steroidal anti-inflammatory drugs (NSAIDs) and opioid analgesics. Drugs for neuropathic pain, such as gabapentin, can also be used when appropriate. in pain symptoms by increasing the stability of the spine and reducing compression. Rehabilitation programs can also address possible aggravators of bulging disc pain, such as poor posture. Epidural steroid injections have also been shown to not only reduce pain, but increase functionality. 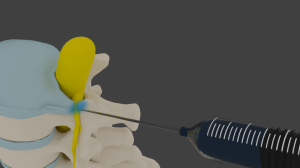 Surgical intervention has the advantage of being the definitive treatment for disc herniation, although this is typically reserved for the more severe cases, and the cases where conservative management has been attempted but failed. At times, it may necessitate a series of up to 3 epidural injections which can be performed a couple weeks apart. The injections may provide pain relief for anywhere from a few days to a few months.